Benet returned to Sondheim for the third time and ArtsEd for the fifth to direct the great vaudeville-inflected musical about the fourteen people who tried to kill the President of the United States. This abbreviated version of the show was staged in the round with the whole company of sixteen sat randomly in the front row from which they'd spring to perform their scenes. Dressed only in black and with a dash of either red, white or blue (the colours of the American flag), the production was staged in a Brechtian style incorporating stage directions spoken aloud and with American flags often taking the place of guns: a symbol of American freedom becoming a symbol of American violence. 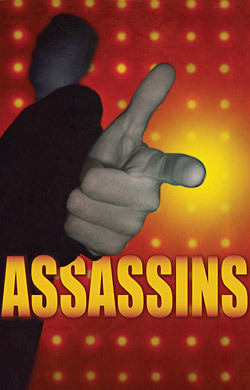 Performed by a dazzling company of second year musical theatre students in front of an audience of their peers, ASSASSINS showed off one of the great American musicals of the last twenty five years while also showcasing the talents of a group of performers from one of Britain's pre-eminnent musical training grounds. Benet returns to ArtsEd to work with other members of the same year group on another Sondheim project this summer.